New research co-authored by Nereus Alumni Andrew Merrie and Marc Metian, with Principal Investigator Henrik Österblom, applies a science fiction prototyping methodology to develop scenarios for the future of fisheries in a changing global ocean. Science fiction prototyping, developed by Brian David Johnson, refers to “short works of fiction, grounded in scientific fact and crafted for the purpose of starting a conversation about the implications, effects, or ramifications of technology and the future.” This method provides a focused and creative way to think about possible futures around a specific issue. 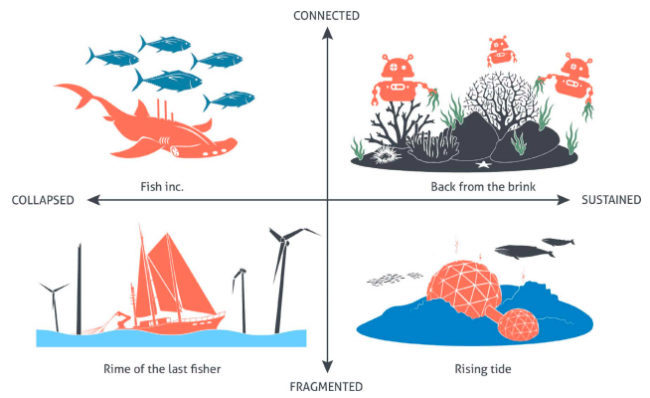 The continuum of the four future ocean scenarios based on ecological (x-axis) and social (y-axis) contributions. Image: Figure 2 from Merrie, Keys, Metian, & Österblom, 2017. Scenario 1 – Oceans back from the brink: Artificial intelligence is used to track fertile fish to enhance conservation of fishes, and robots clean up garbage from the ocean and enhance sequestration of atmospheric carbon to the deep ocean. The primary, widely accepted objective is to restore the oceans from the brink of disaster. Scenario 2 – Fish Inc.: In order to feed the human population in the face of failed agriculture and marine dead zones, large-scale experimentation involving mass artificial productivity and manipulated fish migratory routes is taken on, saving the lives of many humans but leaving unknown damage to marine ecosystems. 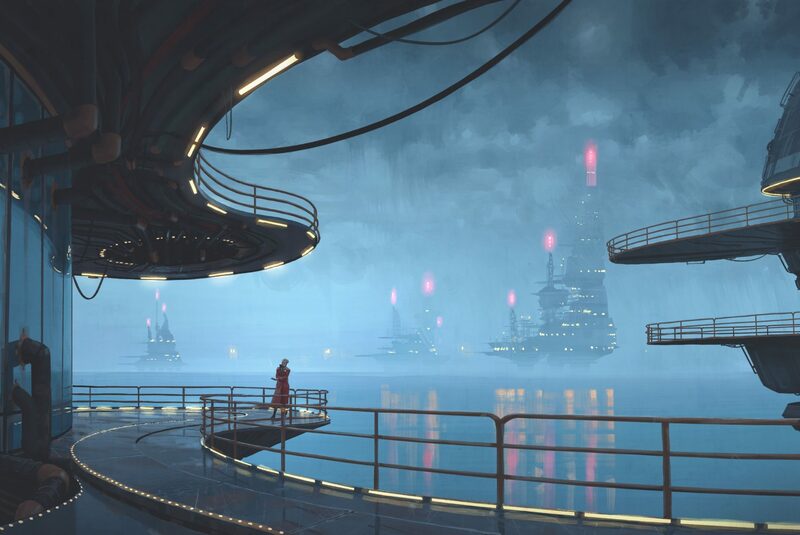 Scenario 3 – Rime of the last fisher: By 2070, the ocean is dead. Leading up to this, anchovies completely disappeared, seabirds died, and mercury contamination rose. Social hierarchy and the rule of law has dissolved. Scenario 4 – Rising Tide: Climate change initiated the melting of first sea-ice, but land masses were soon to follow. By 2037, Bangladesh is underwater. Although social chaos ensues, strides are made to focus on carbon sequestration and greenhouse gas stabilization. This enables the gradual reversal of ocean acidification. As suggested by the four ocean futures, the ocean matters and the future of humanity is closely tied to our treatment of the ocean. It then becomes apparent that long-term allocation of financial resources could generate capacity to invest in global rebuilding efforts for marine ecosystems. Ultimately, this approach may make scenarios more accessible and understandable to non-academics. Further, this research may inform developing proactive governance mechanisms.